And I'm 'learning'/discovering more and more blog thingies as I read and write on. One week ago I'd never heard from the Z-list - I have now (and all the discussion that came with it) More over, I discovered many more very interesting blogs and my RSS reader is getting busier and busier. What a very nice present and recognition for a 'starting' blogger - Liz, thanks very, very much. I'm honoured and touched to be on the list. But mostly the year of friends. Last month I spend a lot of time putting together our business and action plan for 2007 (using a special software program I will come back to on a later date). One of the items in our ‘vision statement’ is having suppliers who work on the same main principle as us: quality, quality, quality; and I don’t mean only the suppliers of the products we sell, all suppliers of products and services we select on this. Quality surfaces in times of crisis (well, in this case semi-crisis). The transport company tried to avoid Calais and the ferry problems by crossing over higher up and coming down South from there. Normally not a problem, but two weeks ago the Motorways were troubled with chaos, road-works, delays and of course Operation Stack. Friday morning our orders still hadn’t arrived at the storage facility we use, slight panic. Our contact at the transport company told us the truck was on its way and he would keep us posted. Halfway afternoon, still no truck. At the end of the afternoon our contact came back to us again: truck was on M25 – stuck in traffic, but slowly moving towards the M2, which in itself was heaving with traffic trying to avoid Operation Stack on the M20. Our storage facility closes at 6 o’clock. 10 to 6: another phone call from our contact: truck is 10 - 15 minutes away from storage. Quick call from us to storage facility: ‘Houston’ we have a problem’. They agreed, very willingly, to stay open for another 30 minutes. 10 past 6: truck arrived and all's well that ends well. And it’s all down to communication, starting with the driver of the truck. He could have left it at faith and hoped to arrive in time; but he didn’t, he called his boss. His boss could have left it at that and hoped for the best; he didn’t, he called us. We could have left it at that and hoped for the best; we didn’t, we called to ask a favour. So, once again a big thank you to Barsan and Space Saver Storage: proper and honest communications between quality suppliers up and down the line will never let anyone down. Besides that, I did notice something peculiar when I had a random look at blogs listed: most are based in the US of A (and there I was, thinking blogging was a world-wide phenomenon). Most be down to blog-networking ;-) ? I did add one of the mentioned blogs to my RSS feed. First of all the name 'hit a nerve': flooring the consumer; hurray, another blog written by a woman in the flooring business - I'm not alone ;-) secondly I will be very interested how changing marketing perception in the floor covering retail businesses across the ocean is evolving; I will keep a close eye on that one to see if changes are 'local' or world-wide. So, thanks for the list, it's a great way to find interesting - related blogs, but voting?? No thanks, not for me. 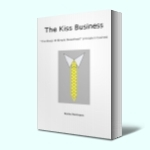 Tagged: 5 things you didn't know about The Kiss Business. Seeing the first stack of 30 copies of the first 'novel' by my own hand was a sight for sore eyes (reading the kindest foreword ever in it topped that). BTW, Merry Christmas to you all. Last Friday I had one of my regular lunch-meetings with my good friend Richard (who I consider my mentor and who's advice and help has kept me sane in some difficult times over the years). One of the topics we discussed was how customers experience our 'niche-market' product/service and how we can improve this further by getting the customer (suspects, prospects etc included) involved in the process/experience as early as possible. The first thing we always explain to suspects, prospects and customers is the principle we work with: KISS (but of course) Keep It Simple Sweetheart. Our websites are very, very informative (as acknowledge by many of our customers, because they tell us) and aims to educate our customers in the benefits and advantages our product has for them. Our FAQ blog turns out to be very popular for doing this bit by bit. During the discussion last Friday we also checked if our aim in educating customers is working and we can always improve our efforts, but the overall feeling is: yes we tick most boxes. Not only Seth's blog talks about this specific subject: Fred on Ideate discusses the same in his excellent thought's on how a customer should be able to experience your company/product/service. "Normally I tend to shy away from using the word "BRAND" because it is very often mis-interpreted to mean iconography - and then a whole day is wasted with inane, unresearched comments and opinions about color and symbology when we should be talking about values and meaning." "Brands are not plans, they are not pictures, they are not mission statements or positioning texts - they are experiential. They are now, they involve the audience. You've got to be there, you've got to perform but without an audience, and without their reaction - you've got nothing." One of the chapters in The Kiss Business novel (our 'story' to keep it in line with both blogs) states exactly the same sentiment, glad others, more and more others, are thinking the same. Branding, marketing, PR? What's in a name? It all comes down to the same policy: making sure the public knows about you (business, products, service) in the most positive way. A logo doesn't do it. Is there a winning combination? In September this year a particular 'blog' discussion triggered my reading virus again. Since then I must have read 8 different titles, mostly by recommendations from others (not all have made it into my top list - like The E-myth revisited and The Fred Factor) and my 'wish-list' on Amazon is still not empty, more to read over the holidays. Most of the books are about major changes in business concepts, changes in marketing, changes in media used in marketing. Some I found real gems, some even a chain of gems. The books that made it on to my top list made me stop and think (and put thoughts to paper on my little note-pad) several times, as good books should do. Some even made me change our business and strategy plan for next year. This made me think the following: of all these various (new) ideas, is there a winning combination between them? I'm sure there is, because some of the ideas - books compliment each other, like "The Long Tail" and "Permission Marketing", "The Tipping Point" and "Unleashing the IdeaVirus". Main question is: how to implement all (new) ideas into your business to become more effective, profitable and even sustainable. Which brings me to the next 'step' of this 'book-review' (doing it by the books 3?) MY Winning Combination and in which order to read them. "The Long Tail" - teaches you to understand that niche-markets are the future (and we are definitely in a niche-market: 80% of floor-covering in the U.K. is still wall-to-wall carpet, 20% is everything else) and why, how Internet and other new media can have a massive positive impact on your profit when you realise and discover where your 'niche' customers are. "Unleashing the IdeaVirus" - this is more than just translating the old 'USP' (Unique Selling Point or Proposition) into online practice, it goes beyond that (and confirms my opinion that it should be OSPS - Outstanding Selling PointS - as mentioned in my novel The Kiss Business). Is your product, service worth talking about; is it remarkable enough to have others 'spread the word' (by word of mouth or by word of mouse). And if you're in the long tail you need to be remarkable. That's another worthwhile combination ;-). The book teaches you how easy (if you make yourself aware of it) it is to give prospects and customers simple and effective tools to spread the word, your word. "Good to Great" - suppose you implement every idea and tip from all above in the correct way to become a remarkable business that can be very profitable and happy in one of the niche-markets of the long tail. In order to become successful and profitable, and to sustain your business as remarkable you'll have to build your whole organisation (even a one-man-band) around these new concepts of marketing and even beyond marketing. If it's just the marketing department that embraces the 'new technology' and the after sales, production and sales-office stick to the 'old and familiar' ways you won't profit as much from all the above; you won't become sustainable profitable, your business won't go from 'Good' to 'Great'. Good to Great, followed by The Long Tail, Permission Marketing, Unleashing the IdeaVirus and then The Tipping Point. As desert I recommend The Goal and Kick Start You Business. But that's just my personal recommendations, I would welcome other ideas, orders or even tips on books I haven't discovered yet. Still haven't figured which book I would recommend to read first, this one or "Unleashing the IdeaVirus" by Seth Godin. Why do some products (and even changes in mentality/attitudes) 'suddenly' seem to be/appear everywhere? What makes 'it' tip into an 'evergreen', have-to-have-one also; creating (profitable) success for the business - organisation that launched it? "The best way to understand the dramatic transformation of unknown books into bestsellers, or the rise of teenage smoking, or the phenomena of word of mouth or any number of the other mysterious changes that mark everyday life," writes Malcolm Gladwell, "is to think of them as epidemics. Ideas and products and messages and behaviours spread just like viruses do." Again, lots of 'ah-ha' moments. Why interrupting marketing (paper, TV, magazine and radio add) is mostly on its way out and why companies are losing out by not asking the most obvious question of their prospects and existing customers: "Please Sir (Ma'am) can I talk some more?" Excellent book to read after "The Long Tail" in order to set up your strategy to turn Chris Anderson's theory into a practical win-win plan.